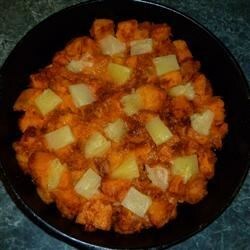 "This is a great Thanksgiving side dish for those of you who are tired of sweet potatoes with marshmallows. This dish also works well with toothpicks on an appetizer buffet." Place the sweet potatoes in a saucepan with enough water to cover. Add 2 tablespoons cinnamon; bring to a boil; cook 7 to 10 minutes; drain. Mix together the 1/2 cup brown sugar and cayenne pepper in a small bowl. Lie the bacon slices in a baking dish. Sprinkle the brown sugar mix over the bacon. Cook the bacon in the oven until the bacon is crispy, about 10 minutes. Place the bacon on a plate lined with paper towels to drain, reserving the liquid from the dish. Change oven setting to Broil. Pour the reserved pineapple juice into a measuring cup. Fill the cup with water to measure 1 cup total. Pour the mixture into a skillet and place over medium heat. Stir in the sugar, 1/4 cup brown sugar, and 2 teaspoons cinnamon. Cook until the volume of the liquid has reduced to about half. Add the pineapple and drained sweet potatoes. Cook and stir until most of the liquid is absorbed. Transfer the mixture to a round 2-quart casserole dish. Crumble the drained bacon over top of the dish. Pour the reserved liquid from the bacon dish over top of the dish. Place the dish under the broiler until the sugar on top caramelizes, 2 to 3 minutes. These were so good! This is defnately a keeper!! Thought this was very good, but a bit too spicy for us. I don't mind a bit of zing, but this was just too much. Will cut the cayenne down to 1/4 tsp. next time. this is a great recipe if you're sick of the traditional marshmallow laced yams. I add about a 1/4 cup of dried cherries into the mix and its great.